In our watermelon muskmelon juice recipe, I had shared with you about different food combinations.We learn't that bad food combinations can hinder digestion. Banana and papaya combine very well and are great when taken together. Both banana and papaya have lots of nutritional benefits, they aid digestion, prevent constipation and help calm the nervous system. This delicious and healthy smoothie is very filling and is full of antioxidants. Here, often the term milkshakes and smoothies are used interchangeable. The main difference between a smoothie and a milkshake is that a milkshake is mostly a blend of milk, ice cream and other flavorings while fruit is the main ingredient in a smoothie. They can also contain milk, yogurt or ice cream. Today we will learn how to make a simple and healthy papaya banana smoothie following this easy recipe. Wash, peel the skin, cut the papaya and scoop out the seeds. Cut it into big chunks. Boil, cool and chill milk in the refrigerator. 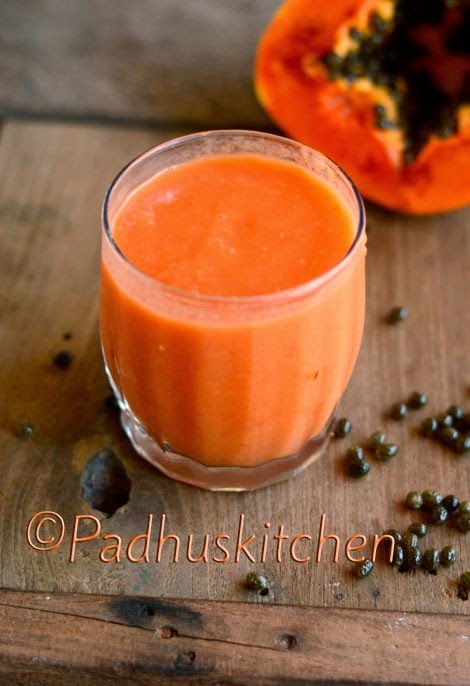 Blend together papaya, banana, milk and honey in a blender until smooth. Pour into a glass and serve chilled. You can add 1 or 2 ice cubes or crushed ice along with the fruits while blending. You can adjust the consistency of the smoothie according to your personal preferences by increasing or decreasing the quantity of milk. Enjoy this summer by preparing this simple, healthy and easy to make papaya banana smoothie. Check out more milkshake, juice, smoothie and other beverage recipes here. Thirst quencher for this summer. Gr8 one. Thanks dear. Very colorful and delicious smoothie.